1.The 2003 discovery of a new frog family, Nasikabatrachidae, in the Western Ghats revealed only a single species, Nasikabatrachussahyadrensis (EN). Existing in only two populations, the new species lives most of its life underground. 2. The black-necked crane ( Grusnigricollis, VU) is the only alpine crane in the world. 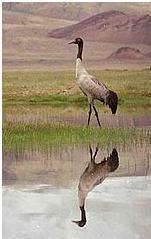 Its breeding range is mostly confined to China’s Qinghai-Tibetan plateau. 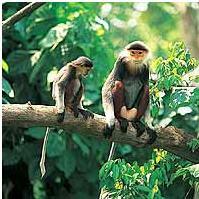 3.The douc langur( Pygathrixnemaeus, EN) is a primate species found in Laos, Vietnam, and Cambodia.